ww2dbaseCommissioned in 1914, the battleship Texas first saw action on 26 May 1914 off Veracruz, Mexico as she supported the US expedition that seized a custom house. She returned to the US on 8 Aug and joined the Atlantic Fleet on 6 Sep. She served a second tour off Mexico between Oct and Dec 1914. During WW1, she trained gunnery crews for service on merchant ships between Apr and Aug 1917, spent some time under repairs, then sailed for Britain on 30 Jan 1918. She joined Division 9/6th Battle Squadron of the Britain's Grand Fleet on 11 Feb at Scapa Flow, and performed convoy duties and a few sorties. On 20 Nov 1918, she sailed with the Grand Fleet to meet the surrendering German fleet. During the inter-war years, she became the first American battleship to carry an aircraft and then served in both Pacific and Atlantic Oceans. In Jan 1928, she served as President Calvin Coolidge's ship to Havana, Cuba, for the Pan-American Conference. ww2dbaseWhen the European War began on 1 Sep 1939, Texas was the flagship of the Atlantic Squadron. She performed neutrality patrols and performed convoy missions for transports bound for Britain. After the United States was engaged in WW2, she patrolled and performed convoy missions all over the Atlantic, though she found herself bound for Britain most frequently. ww2dbaseOn 23 Oct 1942, Texas set sail as a member of Task Group 34.8 for North Africa. She arrived at Port Lyautey in the morning of 8 Nov and engaged in bombardment in the afternoon of that day. She cruised along the Moroccan coast for the following week to offer gunfire support whenever needed. She used 273 rounds of her 14-inch ammunition and six rounds of her 5-inch ammunition during the week. She returned to the United States on 16 Nov and continued to perform convoy duties. ww2dbaseAt the night of 5 Jun 1944, Texas sailed from southern England to support the Normandy landings the next morning. At about 0650 in the morning of 6 Jun, Texas was among the massive fleet that fired thousands of rounds at coastal fortifications, beach obstacles, and inland transportation junctions. In the morning of 7 Jun, her 14-inch main battery broke up German troop concentrations at Surrain and Trevieres; at that evening, she destroyed a mortar position that had been plaguing beach operations. In the morning of 8 Jun, she fired on Isingny and Trevieres. Between 11 and 15 Jun, she provided support for the advancing Allied forces. After the troops moved out of the range of her guns, she moved to Cherbourg with battleship Arkansas and bombarded fortifications surrounding the port city. A 280-mm shell from one of the Cherbourg coastal guns struck Texas at the fire control tower, kill one and wounding many on the bridge; some time later, a 240-mm armor piercing shell hit her on port bow, but it did not explode. Despite the two hits, she continued to fire her primary guns until she retired at 1600. She sailed to Plymouth, England, for repairs for damage received during the Normandy campaign. ww2dbaseOn 15 Jul 1944, Texas departed Belfast Lough for Tunisia in preparation of an invasion of southern France. On 15 Aug, she arrived off St. Tropez during the night. At 0651 the next morning, she began the pre-landing bombardment on defensive fortifications. She remained in the immediate region for the following two days to provide support until the land troops marched past her range. She left the French coast on 16 Aug and returned to New York for repairs. ww2dbaseThree months later, Texas sailed for the Pacific. She reached Pearl Harbor in Dec 1944 and departed for Ulithi on 10 Feb 1945, where she prepared to support the invasion of Iwo Jima. She was one of the vessels that bombarded the island for nearly three days, and then remained in the waters nearby to provide gunfire support. She left Iwo Jima in late Feb and returned to Ulithi to prepare for the invasion of Okinawa. She fired shells from her main guns for six days with no answer from the shore; only aircraft attempted to interfere, but Texas escaped any harm. The ground troops attacked on 1 Apr, and the battleship remained for nearly two months to provide support. ww2dbaseIn late May 1945, Texas retired to leyte where she lay at anchor when the war ended. On 23 Sep, she left Okinawa with troops for San Pedro, California, United States. She made three more round trips between Hawaii and California in 1945 to bring servicemen home. ww2dbaseTexas was decommissioned in 1948. She was towed to San Jacinto State Park where she became a museum ship. 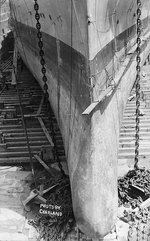 For more information, please see Dennis Mitchell's USS Texas BB-35 website. 18 Mar 1914 Texas was commissioned into service. 8 Oct 1943 USS Texas began escorting an Allied convoy from New York, New York, United States to Britain. 21 Apr 1948 The battleship USS Texas (BB-35) was taken over by the State of Texas to be preserved as a memorial in a specially-dredged canal in San Jacinto State Park, Texas, United States. She also was the first battleship to have an experimental new thing called radar back in the 1930s. The German shell that struck the ship and didnt explode is on display in the forecastle. Some folks touch it for good luck...kinda like Irelands Blarney Stone I guess. Great looking page youve got here! Actually, there was only one combat fatality- Helmsman Chris Christensen was at the wheel on the Bridge when the German shell hit the armored conning tower directly beneath the Bridge. The blast was deflected upwards due to the heavy armor of the Conning Tower (which was the original Bridge of the ship back in 14) and Helmsman Christensen bled out down in the Operating Rm. Capt. Baker was knocked silly briefly as he was right on the outside of the Bridge and all the other crew in the Bridge were wounded- some severe and some not so severe. As for peacetime deaths, there were a few that I know of: a shell fell on a crewmember during replenishment and crushed him, a CPO had a heart attack sometime in the 30s, probably a couple more that I am unaware of. Oops, forgot the date: 25 June, 1944, off the coast of Cherbourg. Wikipedia has a couple of discrepencies in their description of the ships service: she departed Belfast, bound for Algeria, on July 15- not June 16th, 44. She arrived off St Tropez on Aug 15, 44- not July 14th. See this link for a lot of the technical information: http:www.bb35library.com Please remember that we give special Hard Hat Tours of areas that are off-limits to the public to fund our restoration work! Go to http:www.usstexasbb35.com for more info and booking. Hope to see you folks aboard in 2007 (we only have these tours until the weather gets warm- which is about April in south TX). Is there another record somewhere on the combat fatality and wounded? I know my father was wounded and I told another killed on board the Texas during the D-Day invasion. My father was a radio man on the USS Texas during WWII. I was wondering if there was anyone here remember him. His name was Ralph E. Wood. I grew up within bicycle distance from SJSP. I love the Big T. If anyone has not seen her, it's about time ya did. I am trying to find my uncle Arthur P. Welch's name on the roster or something. He served from approx 1942-1944 when they docked in England before the invasion on Normandy and was hit and killed by a bus in 1944. He has no children to carry on his name and anything or anywhere I can find out something about his service would be gratefully appreciate. He was from Newburyport Massachusetts..he was 33 years old when he was killed. Thank you so very much. My father George Albert Foster was on the Texas during WW2 and I remember a picture of the crew on deck showing the rooster flag.We are trying to get info on his battle ribbons and medals. My father just passed away on Nov. 3, 2014. My father, Code Pennington, was a helmsman on the Texas during WW II. He was relieved by the helmsman who was killed and was awoken to steer the ship from below after the attack. So proud of his service and of all the men and women who have served. My Dad was on the Texas at least at Iwo Jima. He was a cook, maybe even the captians cook if they had that?? ?He always wanted to visit the ship but i never got to take him. I found 2 silk squares maybe place settings or napkins if anyone knows. He would have either gone by the name Charles E. Cucknell. Or Charles E. Cooke, im not sure when he changed his name. Is there any type of database on the crew?? i know that would be a long list but i thought i would ask. Thanks All. My brother Michael De Cesare served on the Texas from 1942-1945. Passed away in 2005. Miss him a lot. I was watching a documentary on WW2 on a German channel, even though I don't understand German, I found the commentary on the USS Texas very impressive and tried to know more about the USS Texas. This is how I landed on this page. To Ron Anderson: The Muster Rolls for the USS Texas show Apprentice Seaman Robert G. Anderson USN #300-22-20 of Chicago, IL who enlisted 29 Oct 1940 was received aboard USS Texas 21 Dec 1940 from the Great Lakes Naval Training Station and on 3 Apr 1943 Water Tender 2nd class Robert G. Anderson was transferred off USS Texas to the Receiving Station at Philadelphia, PA. I am looking for any info on LT. (lg) Garrett B. James in his service on the Texas during WWII . My grandfather Oliver Pierce was on this ship. He passed away last week at the age of 98, and was still doing well until then. I've got the Detachment photograph with all names from June 1944.